As gardeners, most of us are used to finding surprises in the garden. Some are welcome and some are not. Yesterday, as I walked outside in my front garden, I was greeted by the following sight…. Aren’t these flowers just beautiful? I would love to share with you the story of how I discovered the plant the produces these very pretty pink flowers…..
Fresh out of college, armed with a degree in horticulture my first job was to manage the landscape areas and trees of a golf course. On a good day, I would have a couple of crew members along to help as long as there was not too much to do on the golf course. The golf course itself rested around a desert mountain and the grassed areas actually made up a small part of the golf course. Landscape areas flanked the golf course while the surrounding hills remained untouched. 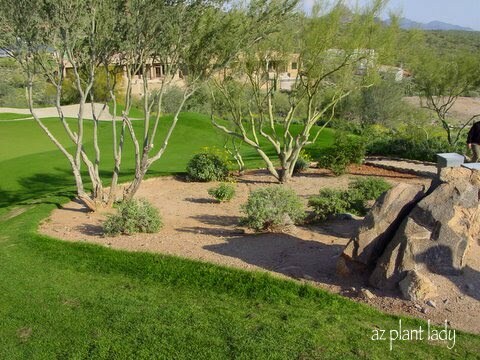 Golf course feature area with Ironwood trees (Olneya tesota), Little Leaf Palo Verde (Parkinsonia microphylla), Bursage (Ambrosia deltoidea) and Brittlebush (Encelia farinosa). Unfortunately, some of the ‘untouched’ desert areas were designated for future homes and were due to be cleared. Before an area was to be cleared I would venture out with my crew and harvest what cacti and native plants that I could. We would then replant them around the golf course. 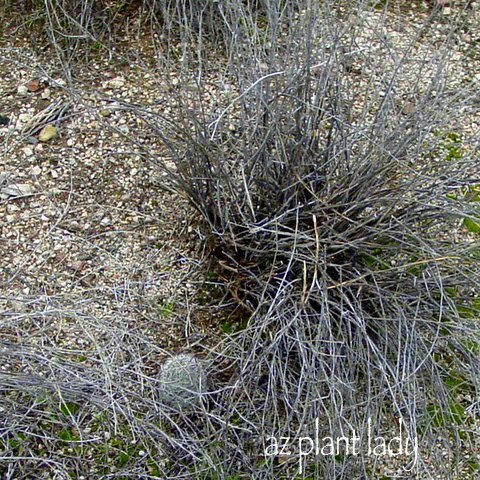 Much of the native desert in our area is covered by a low-growing shrub known as Bursage (Ambrosia deltoidea). Certain times of the year, it is leafless and ugly. However in the rainy season, they are covered with sage green leaves that you can see in the photo above. It was during the month of April that I glimpsed a spot of pink underneath a particular Bursage. As I walked closer to it, I found a little cactus, covered in rings of pink flowers. Known by various names such as Pincushion Cactus or Arizona Fishhook Cactus (Mammillaria grahamii or Mammillaria microcarpa), I was so excited with my discovery. Armed with a pick, my foreman and I quickly dug it up in order to save it from the coming bulldozers. 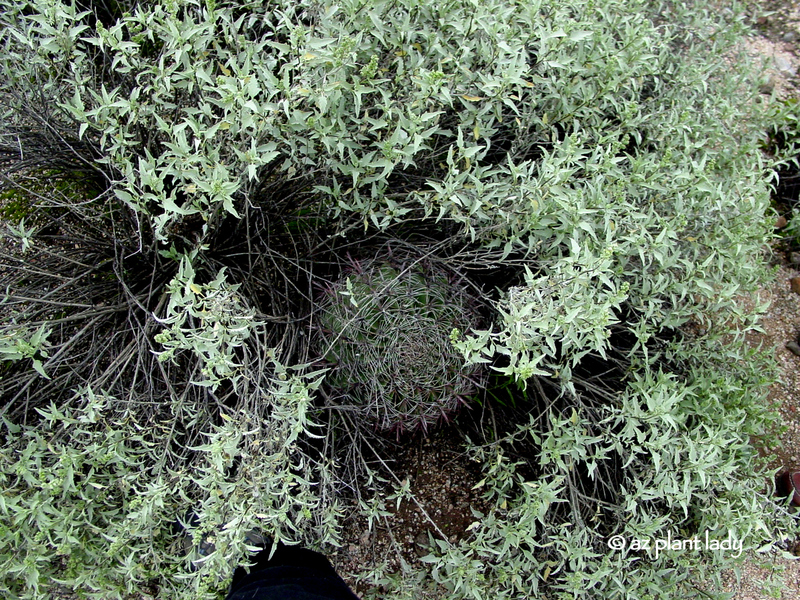 We then began to look to see if we could find more of these little cacti in areas soon to be bulldozed. If it had not been for the fact that they were flowering, it would have been much harder to find them – they only grow to about 6 inches tall at maturity. But I started seeing glimpses of pink everywhere. We started walking all over the desert areas slated to be leveled for homes and were able to save countless little cacti. 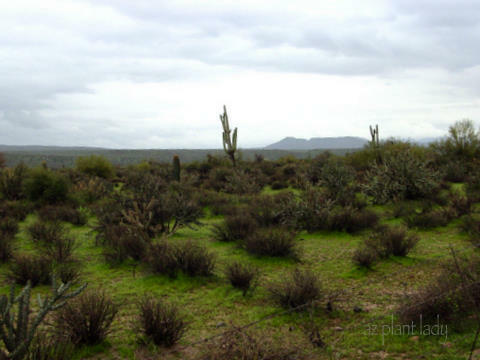 This is ‘untouched’ desert and part of the Tonto National Forest. 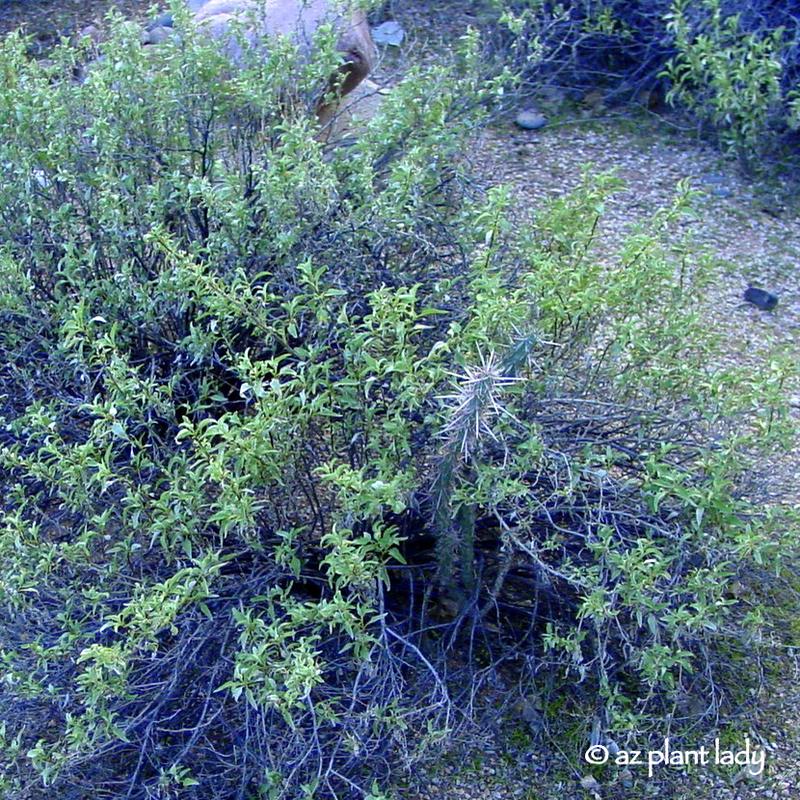 The low shrubby plants are what Bursage looks like before they leaf out. 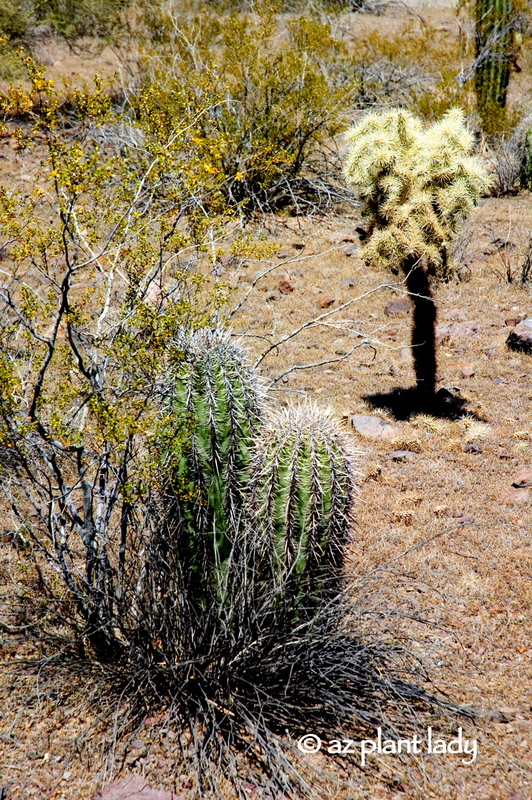 The small cacti often hide underneath. Nowadays, whenever I visit a client whose homes are surrounded by native desert, I often look to see if I can find any of these cacti. I love to show the homeowner the surprise that lurks beneath their somewhat boring Bursage. You do have to look closely, especially when they aren’t flowering. It blends fairly well doesn’t it? Actually, it is hard to believe that the ugly, leafless Bursage has anything of value underneath. The cactus is rather boring when not in flower. But just wait until spring and summer arrive…. Back when I worked at the golf course, my boss gave me permission to take a cluster of little cacti home to plant in my garden. **Note, this is a protected species and cannot be removed unless on private land with the owner’s permission. I planted my Fishhook Cactus over 10 years ago and each year, the clump grows larger and produces more flowers. One of my favorite things about my Fishhook Cactus is that it blooms repeatedly in the summer months in response to the rain. Once it has finished blooming, small, bright red fruits are formed that are edible – they have a tart taste. One of the common names, Arizona Fishhook Cactus, comes from the fact that their spines are hooked.